A very special event was held at the legendary Ryman Auditorium in Nashville, Tennessee on March 27, 2019. Read Billboard's review of "Country Music: Live at the Ryman, A Concert Celebrating the Film by Ken Burns" and get excited for the PBS documentary series this fall. 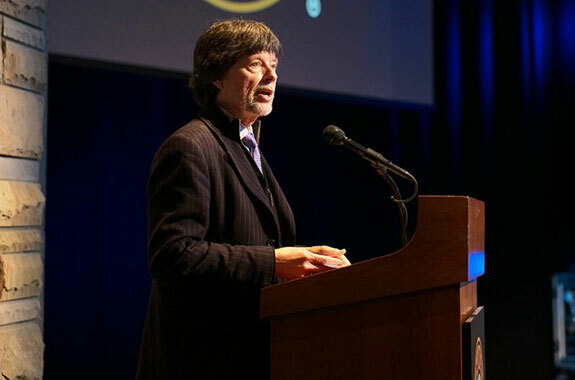 on March 27, 2019 in Nashville, Tenn.
Before the first performance took place at "Country Music: Live at the Ryman, A Concert Celebrating the Film by Ken Burns," the director gave an indication to the audience seated inside the hallowed Nashville venue Wednesday night that both the entertainment unfolding this evening and the 16-hour PBS event premiering this fall would be as eclectic an array of musical styles that could still comfortably fit beneath the country music label, stating that he viewed the genre as many complicated choruses joined together to tell one story. While clips from the PBS film played throughout the night, it became clear that Burns' view of the genre had been captured within the project, as nearly every important turning point within country music was captured in story and song both on the Ryman's screen and stage for the audience in attendance to bear witness to. The evening began with the expertly cast duo of Rhiannon Giddens and Ketch Secor covering the old-time classic "Ruby, Are You Mad at Your Man?" A longtime staple at Giddens' shows, both as a solo performer as well as her work as cofounder of the Carolina Chocolate Drops, she showcased the skills that brought her recognition as a 2017 recipient of a MacArthur Foundation Genius Grant by more than ably handling the duties of vocals and banjo while Secor (Old Crow Medicine Show) accompanied on fiddle. At the conclusion of this opening number, Secor was brought back onstage by Vince Gill to sing "In the Jailhouse Now," as the focus of the evening turned to early country pioneer Jimmie Rodgers' impact as one of the first true country music stars. The evening took on a lighter tone as the focus shifted to the explosion in popularity that the Western film genre experienced in the 1930s, and with it, the Western signing groups that began to take over the radio airwaves. The Sons of the Pioneers (and its most prominent member, Roy Rogers) were praised by "Ranger Doug" Green, who then took the stage with the rest of the members of the Western music and comedy group Riders in the Sky to take on the Pioneers' 1948 hit "Tumbling Tumbleweeds." One of the producers of the film, Julie Dunfey of Florentine Films, then stepped up to the podium to highlight the lengths that those behind the scenes of Country Music went to during the making of the film event in order to cover as much of the genre's history as possible. Since beginning their odyssey, 20 of the 101 subjects interviewed have died, and the 16-hour program is culled from over 175 hours of interviews. It was announced that the Country Music Hall of Fame would be the home of the entire collection of interviews in the near future. Ray Benson and Asleep at the Wheel added more bounce to the evening, as the longtime Austin-based band honored Bob Wills and His Texas Playboys contributions to the Western Swing genre, with a rousing rendition of "New San Antonio Rose." While Wills may have upset some at the Grand Ole Opry during a 1944 performance of the song that featured horns and drums – two instruments by-and-large verboten in country music at the time – here Benson and the rest of the members of his band stuck with a more traditional cover of "Rose," featuring a pair of fiddles on the tune. Vince Gill, who had been playing as a member of the house band for much of the night thus far, was able to take center stage with Ricky Skaggs and Marty Stuart on a rousing cut of Bill Monroe's "Uncle Pen." Skaggs – who had taken the song to No. 1 on the Hot Country Songs chart in 1984 – stated in a clip on the importance of the bluegrass legend shown from the PBS program: "Bill Monroe started a whole new genre of music, and how many artists can say that?" Singer-songwriter Holly Williams handled one of the more arduous duties of the night, as attention was turned her late grandfather, "the hillbilly Shakespeare" Hank Williams Sr. On "I'm So Lonesome I Could Cry," Williams' grasp of the lyrics – Elvis Presley regarded the tune as "probably the saddest song I've ever heard" on his 1973 Aloha from Hawaii TV special – breathed life into a number that has long become a country standard in the years since the death of her grandfather. While few nights go by where someone doesn't perform the song at one of the neighboring honky-tonks along Broadway, it was Holly Williams' voice that echoed the ache of the original in the Ryman this evening. If Hank Williams Sr. is the name that comes to a majority of minds when they hear the phrase "country music legend," Johnny Cash can't be far behind, and the two followed each other on this night as well. Dierks Bentley introduced Stuart to the stage once more, this time to pay tribute to those making history in 1954 Memphis at Sun Studios, where record producer Sam Phillips discovered rockabilly within Cash and Presley's love of gospel and country music. Stuart recounted how he gained a position within Cash's band in 1980 after stretching the truth upon being asked if he played fiddle professionally. Upon completion of Cash's next tour, he sent a note to Stuart thanking him for the youth and life he brought to the band, followed by the question, "Do all fiddles squeak, or is it just yours?" The mandolinist then showed the audience his version of the traditional fiddle tune "Orange Blossom Special," which Cash had long accompanied in concert on harmonica, as the solution that he found in order to keep that early gig. This nod toward Memphis was followed by acknowledgement of the "Nashville sound" that encompasses country music during the time period, as Giddens tackled Patsy Cline's "Crazy." The Bakersfield sound that captured many country listeners attention in the mid-to late 1950s was highlighted by a pair of Dwight Yoakam performances. A haunting version of Merle Haggard's "Mama's Hungry Eyes" was followed by a far more lighthearted take on his 1988 hit with Buck Owens, "Streets of Bakersfield," which had Yoakam bring Bentley out to handle the late Owens' part on the duet. Grammy award-winning vocalist Kathy Mattea then took the stage to perform "Coal Miner's Daughter" during a nod to Loretta Lynn's groundbreaking career, and take-no-prisoners attitude during a time when that was still a rarity from female artists within country music; as pointed out during this portion of the evening, Lynn's "Don't Come Home a Drinkin' (With Lovin' on Your Mind)" was ruling radio as the word "feminism" was first being mentioned on television news programs. A trio of performances showcased some of the rougher hewed performers that began moving to Nashville throughout the '60s and '70s, pushing back against the establishment that were happy to follow the success that they had gained in the years since first embracing the countrypolitan sounds that soon defined the product being exported from Music City. Kris Kristofferson's "Sunday Mornin' Comin' Down" was offered up by a game Larry Gatlin, while Bentley returned to the stage for a strangely modern cover of Waylon Jennings' hit "Are You Sure Hank Done It This Way," while the two bookended a truly resonant showing by Rodney Crowell on Townes Van Zandt's "Pancho and Lefty." No tribute to country music history would be complete without a mention of Dolly Parton's contributions toward the genre's embrace by the world of pop music, and perhaps no better choice could be made to do so than by Vince Gill stepping forward once more, this time to take lead on a cover of the seminal "I Will Always Love You." Stuart, out once more to introduce Skaggs to perform his breakthrough 1981 hit "Don't Get Above Your Raisin'," stopped to point out that Gill might have a future in country music if the 21-time Grammy winner continued to perform like that. The final nod to Cash came in the form of attention being turned toward the 80s, when daughter Roseanne Cash was arguably the most critically successful female artist on the country charts at the time. In a clip taken taken from the PBS program, Roseanne recounted how during one of the pair's disagreements during the time, the elder Cash asked his daughter to appear to perform a duet of his hit "I Still Miss Someone" (which she performed on this night, as well) during one of his shows in her new home of New York City. She did so begrudgingly, only for any hostility between the two to dissolve as she stepped onstage and viewed her father in much the same light as his fans had over all these years for the first time. The night of reverence was capped by all of the entertainers who had attended coming together for an evening capping interpretation of "Will the Circle Be Unbroken?," the early 20th century hymnal made popular by country groundbreakers The Carter Family. Anchored by country and gospel recording artist Connie Smith, all gathered around the microphones onstage for one final performance, while those lucky enough to have been in the audience understood that they had just witnessed history take place themselves.